Quantum effects are becoming more pronounced at the most advanced nodes, causing unusual and sometimes unexpected changes in how electronic devices and signals behave. Quantum effects typically occur well behind the curtain for most of the chip industry, baked into a set of design rules developed from foundry data that most companies never see. This explains why foundries and manufacturing equipment companies so far are the only ones that have been directly affected, and they have been making adjustments in their processes and products to account for those effects. But as designs shrink to 7/5nm and beyond, quantum effects are emerging as a more widespread and significant problem, and one that ultimately will affect everyone working at those nodes. Quantum effects have been observed, studied and theorized for years, and not just in the semiconductor industry. Quantum tunneling, for example, has been documented for nearly a century in alpha particle decay research. But in the chip world, these quantum effects show up in a variety of strange behaviors that are becoming increasingly problematic. At 7/5nm and beyond, there is a whole new set of worries to add to the list that are associated with quantum effects. Flash memory was one of the first places that chipmakers began experiencing quantum effects firsthand. Beginning several years ago, NAND memory companies reported seeing unexpected irregularities in how data moved in and out of memory. There is research underway to minimize tunneling by electrons through thin materials. One such approach is a spin lattice, which can localize or “contain” the stray electrons. Spin transfer torque (STT) MRAM changes the spin of electrons using electrical current rather than magnetism. Gate tunneling was a key reason for the introduction of high-dielectric-constant gate materials. Their increased physical thickness for a desired equivalent oxide thickness reduces tunneling. But at advanced nodes, that isn’t possible because gate oxides shrink with the rest of the features. Stepping into the world of quantum physics, quantum effects are largely a function of the dual nature of electrons, both as particles and as waves. While physicists hvae been working with these concepts for decades, they are well outside the scope of electrical engineering. But the fields begin to overlap at 7/5nm and beyond. And while quantum physicists may call this elementary, the practical application of these concepts can be quite complicated. The impact isn’t always obvious. For example, Imec’s Mocuta points to transistor body scaling, which is gradually becoming a requirement for maintaining electrostatic control. Quantum effects show up as thinner fins, which ultimately will force a move to gate-all-around transistor structures using nanowires or nanosheets. That move isn’t far off. Samsung Foundry unfurled its transistor roadmap this week, which included the introduction of gate-all-around FETs starting at 3nm using nanosheets. Yongjoo Jeon, principal engineer at Samsung Foundry, said initial versions of the PDK will arrive next year, with mass production of GAA FETs beginning in 2021. Those chips are expected to provide about a 20% improvement in power and performance, he said, compared with about a 30% to 40% increase in power and performance in previous technology generations. “At very small dimensions of the body, the semiconductor band structure gets ‘quantized,’ so instead of a continuous energy spectrum for the carriers, for example, only discrete energy levels are allowed,” Mocuta said. • A transistor threshold voltage change. • A change in the density of states (DOS), or the number of carriers available for current conduction. • A change in carrier injection velocity. The transistor threshold voltage change can be readily corrected with process technology. But changes in the DOS and the carrier injection velocity cause drive current changes in the device, said Mocuta. And that, in turn, can affect the performance of a technology built using these transistors. As gate length is gradually reduced to accommodate scaling, the consequences show up in two main places. One is in the transistor OFF state, where carriers can more easily tunnel from the source-drain. That results in an increase in OFF current, and higher power consumption. 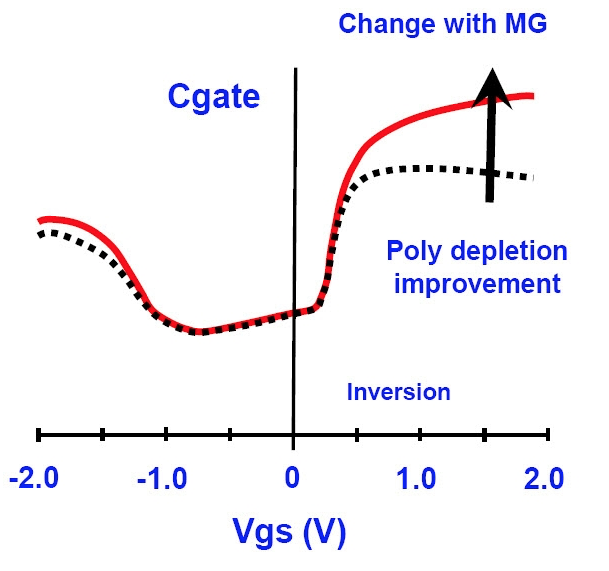 This typically happens for gate lengths below 10nm. The second occurrence is when the carrier transport becomes increasingly ballistic, which occurs at gate lengths below 20nm, said Mocuta. Exactly how quantum effects will impact designs below 5nm isn’t at all clear at this point. What is clear is that there are more effects to deal with, and much more engineering will be required throughout the supply chain. Quantum effects used to be considered more of a novelty than a set of critical design criteria. In the future, that is almost certain to change. Below 7nm, chipmaking will dig much deeper into the intersection of electrical engineering and quantum physics. The big question is whether this ultimately will lead to technology advances that can harness these effects. For example, there is research underway to alter the band gap in semiconductors by utilizing free electrons. That research is still in the early stages. The other possible outcome is that quantum effects will simply be new and expensive annoyances that need to be managed across more designs. Right now, it’s too early to tell, and so far there are very few people talking about it. —Mark LaPedus contributed to this report. Costs of developing a complex chip could run as high as $1.5B, while power/performance benefits are likely to decrease. Complicated and expensive technologies are being planned all the way to 2030, but it’s not clear how far the scaling roadmap will really go.